ARTistic Pursuits has long been my family's favorite art curriculum publisher. Our most recent favorite AP find is the book intended for grades Elementary 4-5, Book 2: Color and Composition. There is a big difference between opening a new book and knowing you'll love it and hoping you'll love it. We always know we'll enjoy the lessons from an ARTistic Pursuits book, and this one didn't fail us. My girls are in 3rd and 4th grade, but both kept up easily, though it is intended for grades 4-5. It wasn't dumbed down or anything, in fact, I think my high school students would have enjoyed it just as much. Since it seems much of my attention is usually spent on the older students though, I thought this would make a nice class for the girls and I to spend some special time together. It was a special time, but little of it was together. I read the lessons to them and then they were off and running, eager to observe the outdoors, examine pieces of art, and to create their own works completely independently, thank you very much but I can do it by myself. Well, allrighty then! And they did. Their first landscape watercolor pencil drawings (paintings?) Don't get me started about the hole punches in Honor's picture. Though the theme of this book is color and composition, it isn't a basic book of "red and yellow make orange". We have only finished the first 2 Units so far, but already we have discussed pigment, wet and dry mediums, and color mixing & placement. We have learned how to use watercolor pencils, how to do hard and soft edges, and most of all, we've learned how to observe. This book contains 16 Units. Each unit contains 4 lessons. These are intended to take about an hour per lesson, two lessons per week. The first lesson of each unit builds students' art vocabulary. Students study the meaning behind phrases such as intermediate colors, composition, color value, and much more. The second lesson of each unit introduces art appreciation and art history. Whatever element of art is introduced in the lesson is also taught by observing the masters and observing the elements in their artwork. The third lesson of each unit teaches technique. Students learn how to properly use art tools to create original works of art. 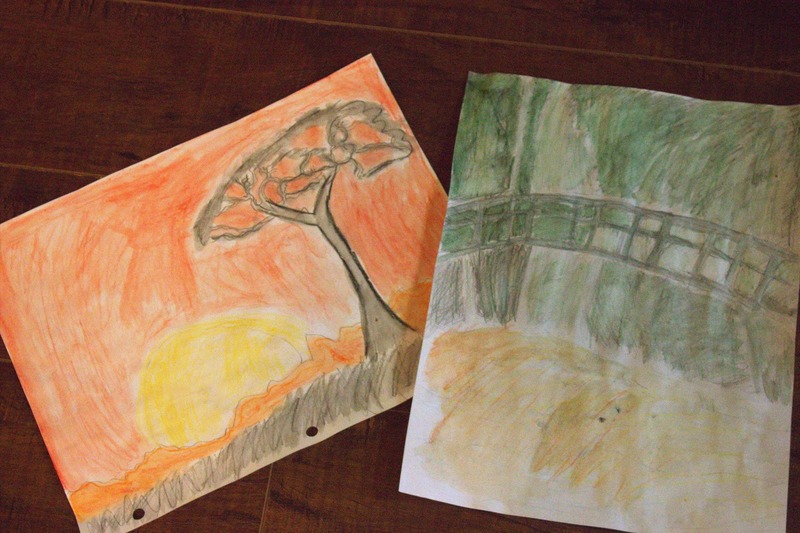 There are assignments every day that result in original art from the student, not just on third lesson days. These are just very specific technique assignments. The fourth lesson of each unit incorporates all they've learned in the unit, giving opportunity to apply those lessons using various formats. They were to imagine themselves super-tiny and looking close at something from outside. Honor chose a dandelion and Gracie chose a lilac bunch. 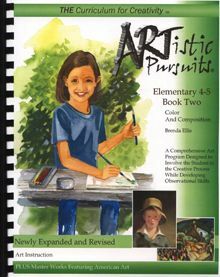 ARTistic Pursuits Elementary 4-5 book two costs $47.95 and comes with 92 pages, making up 68 lessons, and includes 218 great illustrations. They have many more books for many more levels of art instruction, including newly released books on Sculpting! You can read reviews on many of those books by following the link below. 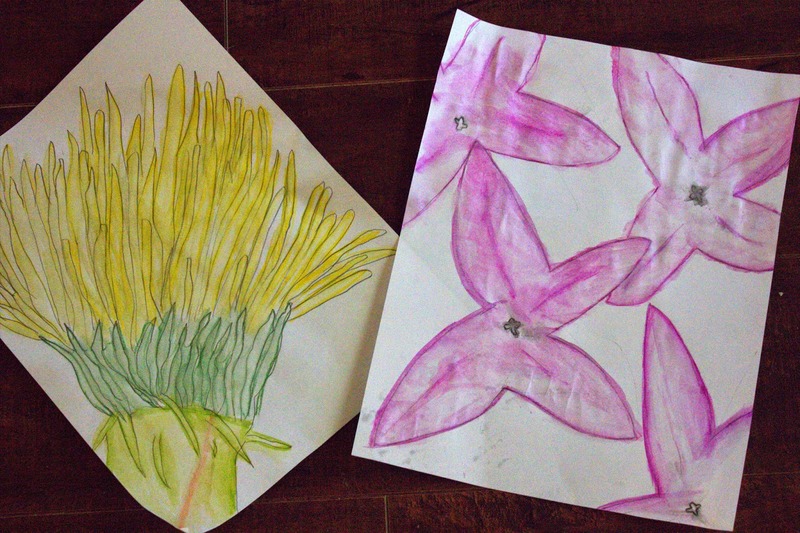 their drawings of the flowers are fantastic! Great job! They did a great job on the watercolors. I especially like the close-up view of the flowers. Thank you, gals! They loved creating these!